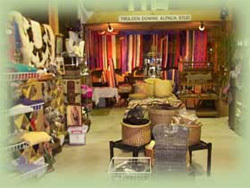 TRULEEN Downs is a delightfully unique blend of a working alpaca stud farm, farm tours, a bed and breakfast and supplier of alpaca products. Colleen Long and Trudy Bailey, the owners of Truleen Downs Alpaca Stud Farm, breed and sell Alpacas as well as conduct tours with groups. Tours include farm walks and talks hosted by the farms owners - Colleen Long and Trudy Bailey. During the tour they talk about the Alpacas, and their origins, habits and market value. Clean comfortable self-contained accommodation with full breakfast provisions. All facilities including pool table, games and reading material. Quiet secluded location in the picturesque Toomuc Valley at Pakenham, just one hour from the CBD. 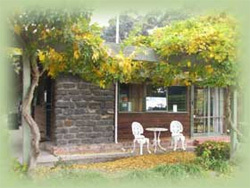 Located at the end of the house the B&B is fully self contained and private with its own entrance. Generous Breakfast provisions with a comprehensive range of modern amenities including air conditioning, TV, CD Player, Video etc. We stock beautiful, soft and long wearing Alpaca garments which include, jumpers, capes, cardigans, jackets, vests, berets and gloves. We supply knitting yarn and fleece for spinners and have an assortment of wall hangings, continental quilts and blankets.We stock a wide range of beautifully hand made crafts, jewellery and an assortment of knits, scarves, shawls, ponchos and hats. Both Australian made and Peruvian imported. 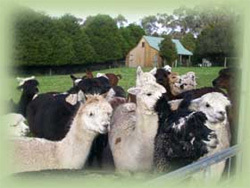 Email "Truleen Downs Alpaca Stud Farm (New)" now with an Inquiry or Request. Complete the form below and press the Send button.